Our townhomes at Corktown Mews are nearing completion and we wanted to give you guys a look at our progress all the way through to the end. People are already moving in to the completed units and starting their life in Fieldgate’s first downtown development. 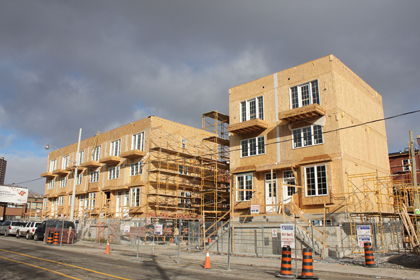 Here we can see a row of completed townhomes, with the balustrades installed above the entry doors and enclosing the balconies. This is a front entrance onto River Street. 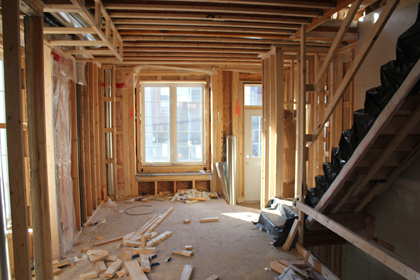 Here is how the townhomes look from the front when they are completed. We love the balconies and the protruding main floor windows. 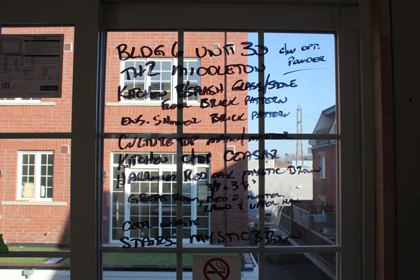 The supplies that will be used to install the finishing touches around the Corktown Mews neighbourhood. Each home has individual mailboxes, so it’s easy and convenient to get your mail, even in a townhome complex. Our sign on Queen Street, letting the outside community know we are almost sold out! Two more units within Corktown Mews. There are still some finishing touches to be added to complete construction. Our covered garage doors and neighbouring balconies. Looks like a great area for a block BBQ! One of the last construction vehicles on the site. We’re so close to completion! The front of one of our 2 unit homes. 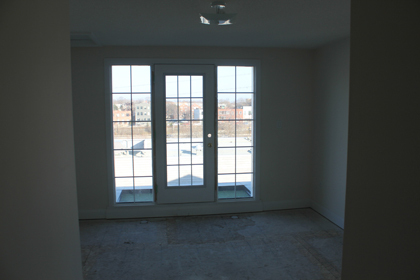 Lots of windows means tons of natural light! These are 2 of the final units to be completed. There’s still some more stuff to be done! A sneak peak at the beginnings of a landscaping project. The view of Corktown Mews from Queen Street. We think it looks great! 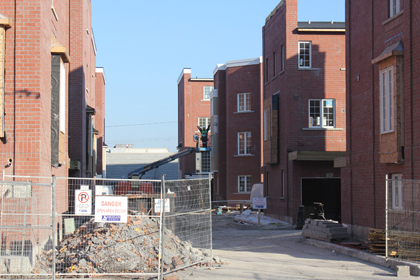 The view of the back of some of the homes in Corktown Mews. Just about done! As a downtown development, we are proud to be bringing Fieldgate quality into Toronto’s core. We only have 1 unit left to sell! If you are looking for suburban-style living with the convenience of living downtown, you should be considering a home in Corktown Mews. We are also available on Facebook and Twitter. 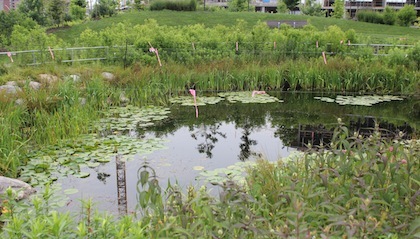 Corktown Mews – Fieldgate Homes’ Newest Community Almost Ready! 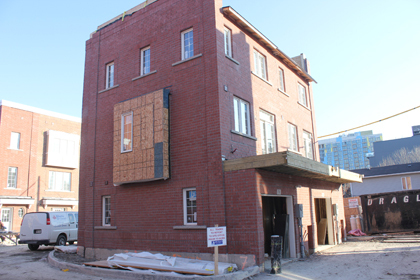 It’s nearing crunch time at Corktown Mews. The first adventure into the downtown core for Fieldgate Homes is nearing it’s occupancy date and as of this writing, most of the blocks are awaiting the finishing touches! Follow past the jump for a quick update as to how things are looking as we anxiously approach the finishing touches on this community. We made our first visit to Corktown Mews of 2013 to check out how much there is left to do before this fantastic community is ready to move into. Construction workers are clearly excited about the amount of progress that has been made in the last few months, with their eyes on the final stretch. 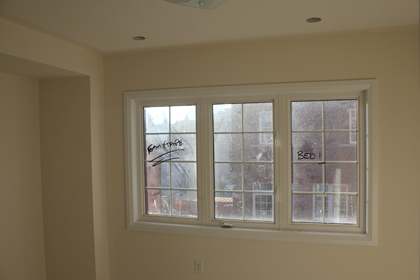 We’re telling you, this writing on windows thing is a trend that’s only going to gain popularity from here. Here are some instructions for a unit in progress. View of the great room from the kitchen. 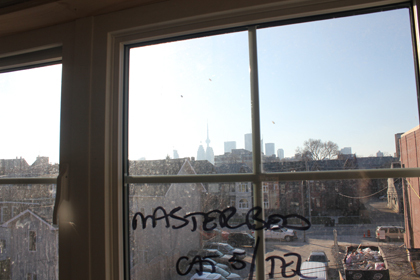 We’re not going to lie, we’re a bit jealous of this view from the master bedroom of an almost completed unit. 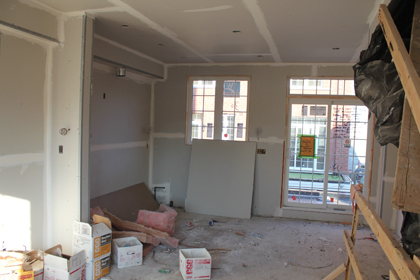 A view of the kitchen in progress. here are one of the finished Garages in the units. that door opens up into a small rec room. 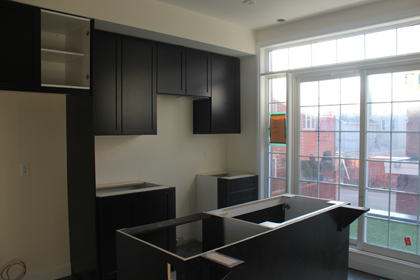 Here’s a kitchen a little further along in the process, cabinetry and flooring is installed. 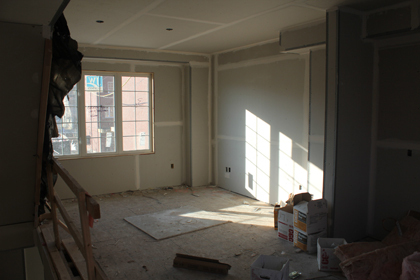 This unit has been painted and drywalled. 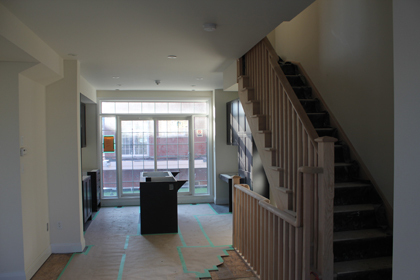 Railings have been installed around the stairs and work is underway on flooring the rest of the unit. 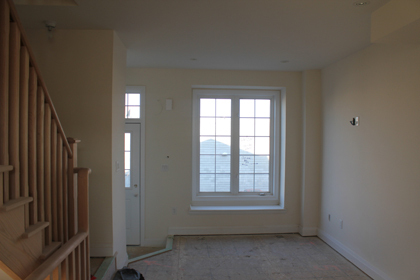 This is the first of 3 bedrooms in this unit. 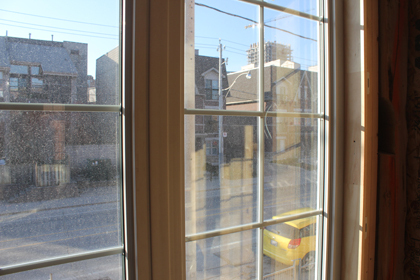 Here is the view from the back block of Corktown Mews. Up one more floor the the master suite, the bedroom comes with a balcony, with the bathroom on the west side of the unit. 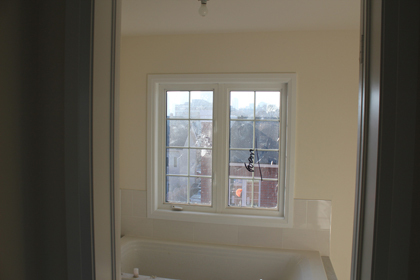 The aforementioned bathroom, with most of the fixtures already installed. 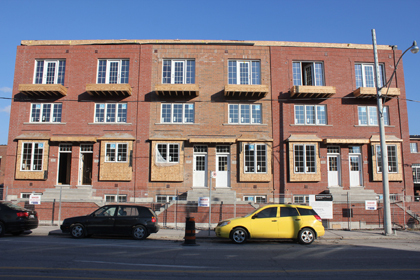 These units in the back block of Corktown are almost good to go, How exciting is that?! Moving on to the block closest to River st., you can see that the framing is in place on the main floor and entryway downstairs. 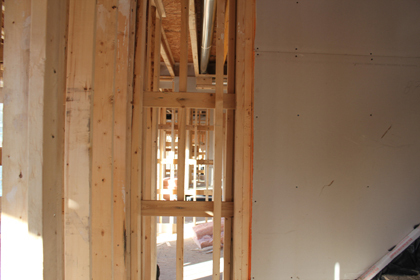 Drywalling has taken place on the upper levels of the house. 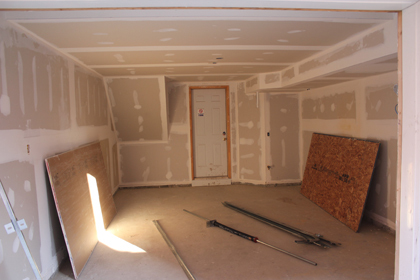 It’s best to drywall from the top down, for the wiring, ductwork and plumbing is easier to install going down to the furnace, breaker panels, and sewage system. Just a quick peek at River St. 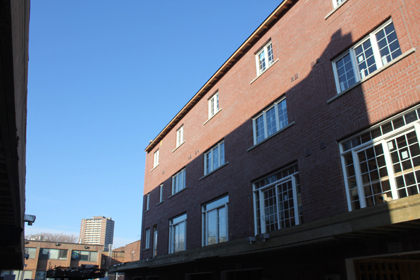 The exterior and patios are being finished at the moment, most blocks are not too far away from completion externally. And that concludes our visit to Corktown Mews. The next step will in all likelihood, be move-ins! As of this posting there are currently 2 units still for sale. This is a fantastic development in the area of River St. and Queen st. East in lovely downtown Toronto. Enjoy downtown living with the comforts of suburbia. To learn more, or to register for updates regarding our “Corktown Mews” development – Go here now! Need to be in the know with all Fieldgate Homes projects? Follow us on facebook and on twitter. Not much longer to go! Be sure to let us know how excited you are in the comments below! 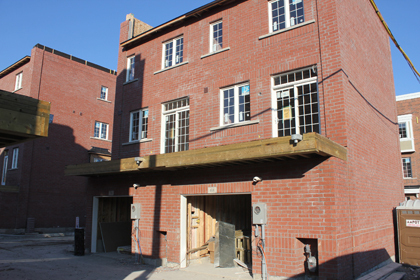 Corktown Mews December Construction Update! Despite the ominous looking clouds behind us, it was a fantastic visit to Corktown Mews last week. 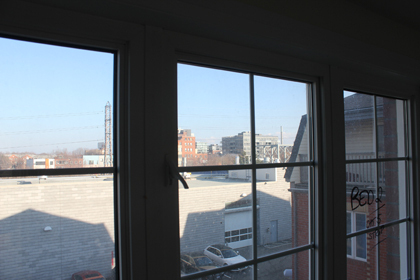 We got some photos of what will be the last visit to Corktown for 2012! All of the blocks are well underway to being completed. Bricks are on some of the first blocks while framing and windows are being installed on the final blocks.